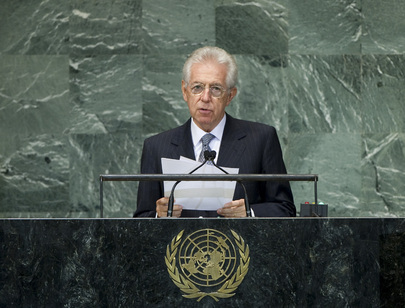 MARIO MONTI, Prime Minister of Italy, said that, in 2011, the financial markets had shown serious new signs of tension, due primarily to the deterioration of public finances. “What we are experiencing is not a recurrent cyclical imbalance; it is the deepest and worst crisis in the history of the European Union.” Other crises had threatened the continent in the past, but each time Europeans had found a way to continue down the path on which they embarked more than 50 years ago. He cited, in that respect, Jean Monnet, who wrote that “ Europe would be built through crises”. Indeed, it was by solving those crises that Europeans had realized how closely integrated their interests were and how interdependent their economies. Today, the world had learned how essential a viable Europe was to tackling global economic and security challenges and how important the euro area was to the recovery of the global economy. “Today, it is clear that ‘more Europe’ is in the general interest,” he said. However, nothing could be achieved without good will and good faith, which would be needed if the world was to put an end to the ongoing massacres and the massive human rights violations in Syria. The regime in Damascus refused to comply with Security Council resolutions and it continued to commit indiscriminate violence against civilians. Italy fully supported the mission of the new Joint Special Representative for Syria, and strongly urged the Security Council to overcome the stalemate that was preventing international action. “History will not be lenient in judging those who bear responsibilities,” he said. Respecting the rule of law was the basic condition for promoting human rights and maintaining international peace and security. In that vein, Italy announced that it was ready to accept the compulsory jurisdiction of the International Court of Justice in accordance with article 36(2) of its Statute. In addition, despite the current financial juncture, Italy continued to do its part in crisis management, peacekeeping and stabilization missions. Its expertise and resources — both military and civilian — would remain engaged in a number of critical theatres, especially Afghanistan and Lebanon. Those commitments constituted a “heavy burden, but one we deem a worthy investment for the sake of the common interest”. Finally, he turned to the Millennium Development Goals, which had played a crucial role in changing development cooperation policies and practices. Since they had initially been agreed upon, however, the development landscape had changed deeply, with new challenges emerging and other issues and processes coming to the fore. The post-2015 development agenda would, therefore, have to take those trends into account, and include such important dimensions as reducing inequality, fostering credible democracy, promoting human rights, good governance, equitable growth, migration, employment, decent jobs and tackling climate change. An inclusive process for elaborating that agenda was crucial, as was the harmonization of the post-2015 Goals with the inputs that had emerged from the United Nations Conference on Sustainable Development — “Rio+20” — concluded in June in Brazil.